LEGISLATURE 2019: YOUR DEMOCRACY. USE IT. Our lobbyist works before, during, and after the session to inform and educate DRA members about upcoming legislation and to encourage members to directly lobby their legislators themselves. This work includes lobby trainings where she teaches members about how to talk to legislators, encouraging members to write letters and emails to their legislators, and hosting lobby days up at the capitol building during the session. DRA also encourages members to hold house and community meetings to ensure the general public is informed about the issues during the session, to write letters to the editor to their local newspapers, and to help keep their own communities engaged. DRA keeps its members up to date with weekly Legislative Updates and a yearly Legislative Guide, both mailed to our membership. Our blog is updated a few times a week during the session to keep you connected and informed, and Action Alerts inform you of issues needing immediate action. Join today to receive weekly updates in your email or mail box and support grassroots organizing. OUR WORK IN PIERRE IS 100% FUNDED BY MEMBERS. It costs nearly $6,000 to fund the session’s work, as well as travel expenses for members to testify in Pierre. 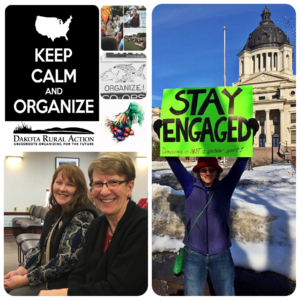 Please consider donating today to support our work in Pierre financially this session. Just $50 will cover one member’s travels to Pierre. Your gifts are deeply appreciated and have directly benefited our many legislative victories over the years. Keep it short and sweet: They are very busy during the session, and will be able to take your opinion into consideration better if they can quickly understand what you are writing about. Ask for a specific action: If there is a vote coming up, or if you want them to bring up a certain issue, ask them that directly so they know what you are asking them to do. Make a phone call – It can be difficult to get in direct touch with legislators during the session, but you can call the Capitol and leave a message or call them directly. Keep in mind they do not have a lot of time to talk, so be prepared to tell them quickly what you think or leave a short message with an intern. Attend a cracker barrel – Hosted in many South Dakota cities, cracker barrels (sometimes called legislative coffees) are attended by legislators throughout the session, and are a great place to ask legislators questions directly. Write a letter to the editor – While it is important to talk to your legislators about their votes, it is also important to let your community know what is happening as well. Most newspapers publish letters to the editor on an on-going basis. Check the paper’s opinion page or website for their submission requirements, and be sure to let us know when your letter is published so we can promote it as well. Hold a house meeting around an issue – You know your neighbors best, and this is a very informal (and fun!) way of getting them informed and involved. 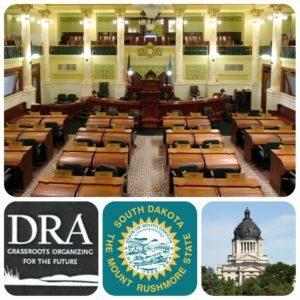 If you want to host a house meeting around a piece of legislation or a particular issue, a DRA organizer can help you with how to get one going and how to run it. As always, personal contact is the best way to get the word out, and house meetings can even be attended by legislators. Nothing – and we mean nothing – is stronger than citizens’ voices, rallying around an issue.